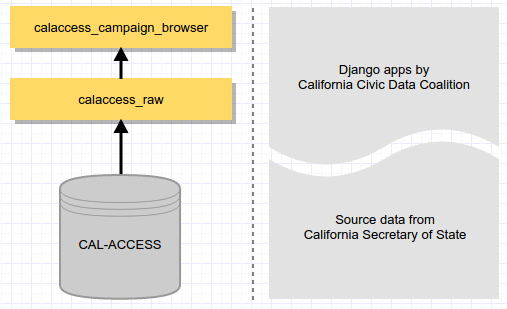 A Django app to refine and investigate campaign finance data drawn from the California Secretary of State’s CAL-ACCESS database. Intended as a second layer atop django-calaccess-raw-data that transforms the source data and loads it into simplified models that serve as a platform for investigative analysis. This is a work in progress. Its analysis should be considered as provisional until it is further tested and debugged. Development has been advanced by a series of sprints supported by Knight-Mozilla OpenNews. © Copyright 2016, California Civic Data Coalition. Revision 23b389ef.